← Happy Birthday to Green Idea Reviews! Red cupcakes for Valentine’s day, green cookies for St. Patrick’s and lovely pastels for Easter: Coloring baked goods to suit your fancy is a fun way to express yourself in the kitchen. But the artificial dyes used to do this are generally chemicals that have a shady history and are hazardous to your health. Some natural chefs have turned to healthy fruits, vegetables, and spices to color their confections. Do natural food based dyes work? Better for you – food based dyes are made of healthy foods like fruits and veggies. Synthetic food dyes are made of chemicals that can be toxic. Better for the Earth – most food dyes can be made by you in your kitchen from fresh produce you were going to eat anyway. So no need for manufacturing plants and packaging waste that can harm the environment. Easy – with a juicer, you can make your own colored dye solutions quickly and simply. Mild flavor – the fruit and veggie juices work at a low enough concentration that they don’t have a big impact on flavor (no spinach flavored cake here!). Great color – the natural dyes really work, for some of the colors. Takes a little extra work to juice your own beets, or carrots, or whatever you’re using for color. Some natural colors are not as vibrant as synthetic, or fade during baking. Making a rainbow cake takes a LONG TIME! This beautiful cake was what I was trying to achieve. Keep reading to see how mine actually turned out! Source. 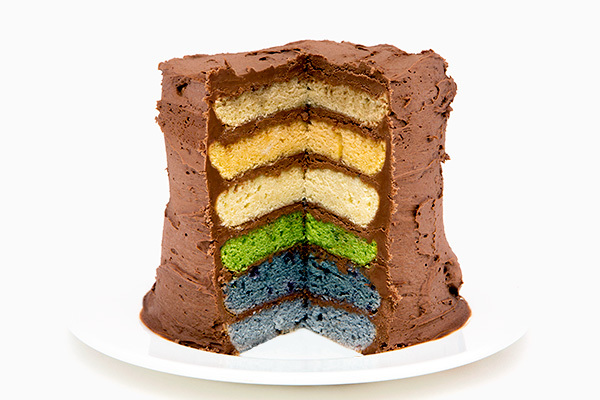 Rainbow cakes seem to be all the rage these days (on Pinterest anyway). I love rainbows! They are bright, and colorful, and happy, and they make me happy too! I was thrilled when I found a recipe for a rainbow cake using natural dyes, and I thought that it would be a perfect Green Idea to test out for Green Idea Reviews’ first birthday. 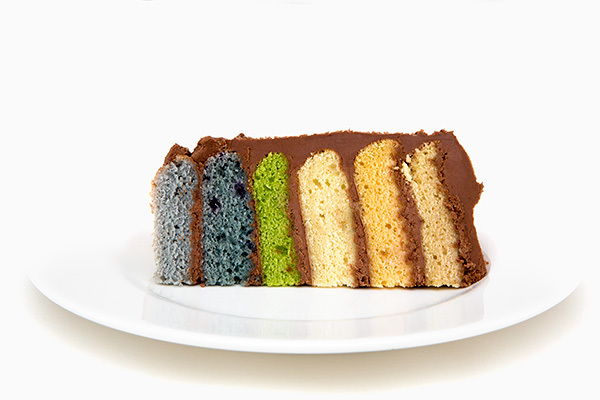 The instructions for making this cake are pretty basic, with the exception of splitting it six ways and putting a different color in each. This was the most difficult part of the project. It was hard to find the right size baking pan for a little cake (I ended up using my 4 cup round pyrex storage dishes). I didn’t have enough to cook all the cakes at the same time, so the baking had to happen in batches. And I had to make up the dyes for each layer separately. That took a good amount of time as well. The preschooler and I decided to do a chocolate frosting. Sure, vanilla white would be prettier. But honestly, we feel that if it’s not chocolate, it’s not worth it! I whipped up a quick chocolate buttercream (recipe here) and set to work building and frosting the cake. Overall Color Assessment: Most of the colors looked pretty good! I was especially impressed with the green spinach coloring. The blueberry coloring was a little dicey, as it was more of a purple than the blackberry juice prior to baking. But it came out looking bright blue once cooked. The blackberry purple was much lighter on the inside than I would have preferred. But the beet red was by far the most disappointing. Even though the outside of the cake was a nice pink, the inside seemed to have no color at all. I’m not sure what happened with the beets. I wonder if I did it wrong? But I put twice as much beet juice in the batter as any other color and it still didn’t work. I’ve had unsuccessful experiences with beet juice food coloring in the past. When I used it to dye Easter eggs, the eggs came out a brilliant fushia, but faded to rusty brown by the next morning. Perhaps beet coloring is not stable once it leaves the beet? 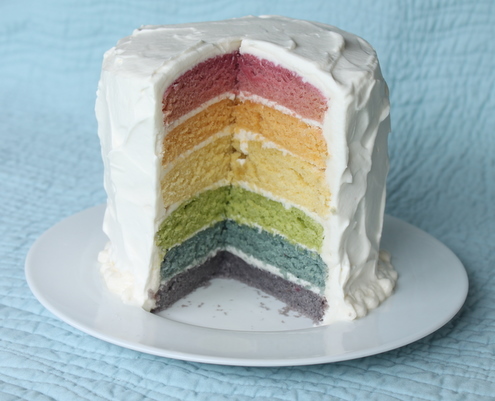 Also I’ve noticed that almost all of the bloggers trying out the natural rainbow cake use the exact same picture that came from who knows where originally. So, I’m not sure what to think about that… just saying. Overall Taste Assessment: This cake tasted good! Obviously anything with homemade dark chocolate butter cream icing is pretty awesome, but the cake itself was tasty too. I did not notice a beet flavor, or spinach flavor, etc. My kids ate it right up (of course – they rarely get treats like this!). A friend who tried it also agreed that it was “aMAzing”. She also noted that she could taste the faint flavors of berries in the bottom layers. I didn’t notice, probably because my taste buds were busy wigging out on CHOCOLATE!! Overall, Overall Assessment: Overall, it was fun to try the rainbow cake once. The concept is really fun, the flavor is good, and the colors are decent. However, it was a TON of work. I don’t think I would do this again unless it was a special occasion where I really NEEDED a rainbow cake. That being said, I would definitely recommend most of the colors above if you need a single tone cake or colored something else. They would work great! Have you tried using natural dyes in your baking? What worked for you? Any tips on getting a good, natural red? This entry was posted in In the Kitchen, Real Food and tagged better for the earth, better for you, cooking, cooking from scratch, easy, homemade, kitchen, real food. Bookmark the permalink. 34 Responses to Making a Rainbow Cake with All Natural Food Coloring Review – Does it Work? I’m really surprised at the beet color! I mean, that stuff usually stains EVERYTHING. Maybe you got a bum beet? I love how green the spinach layer is, though. I think a whole cake dyed using spinach would be fun by itself! Wow! It’s interesting how differently the different colors turned out. Maybe cranberries would give a good red? Oddly, this reminds me of a project I did in 8th grade with conventional food coloring. I was going to a party at the very beginning of spring, so I wanted to bring pastel cookies shaped like flowers, but I wasn’t going to have time to let them cool enough to frost them, so I mixed different colors into several lumps of dough and then used a flower-shaped cookie cutter. They looked so cute going into the oven! 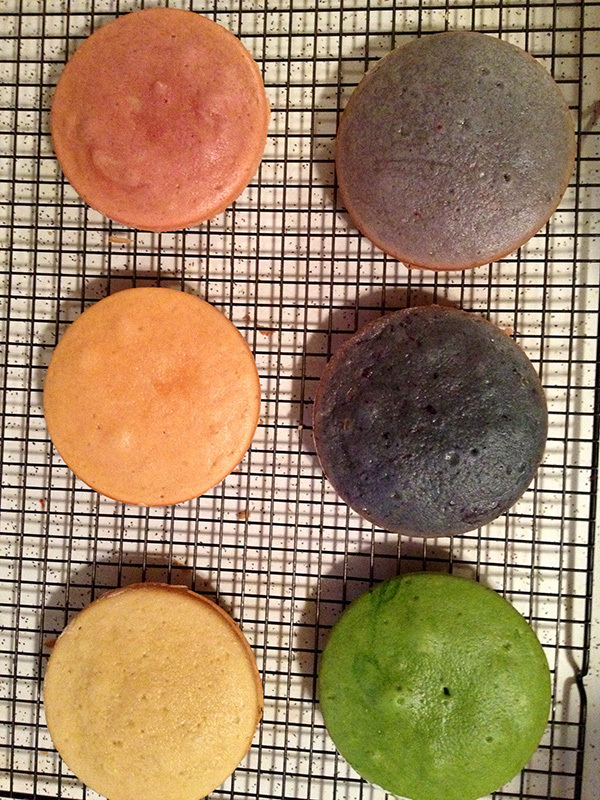 But only the pink and yellow had much color on the outside after baking. 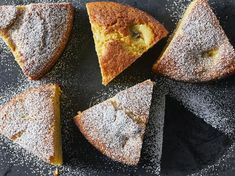 The blue and lavender were grayish-brown on the outside and only had a little color in the middle–the opposite of your cakes with more color on the outside. I love this cake! So pretty and so good for you! I’ve had my eye on those rainbow cakes for a while now but I just couldn’t bring myself to make one because of all artificial food colouring that goes in it. Using natural food colouring is a great idea! It does look like a bit more work but I think it’s worth it to avoid all those nasty chemicals. I’ve notice the same thing with making beet muffins. The outside is nice and pink but the inside is brown. I don’t know why that happens. I wonder if raspberries would work for a pinkish-red colour and maybe tumeric for yellow (don’t know if tumeric would flavour the cake strangely though…). Thanks for sharing. I’ll be definitely pinning this! Beautiful! I’d love if you’d come share this post too at Eco-Kids Tuesday!! Oooooo beautiful!! I really love this idea and I’ll have to try it sometime! I love your blog too, I found you on the down home blog hop! The first two links I clicked on were both yours and I loved both articles! Definitely adding you to my list. I have had the same problem with beets! I use the food gels for coloring, but try to use natural colors too, to see what i can get with them and have done beets a couple times. Thanks for sharing your experience! can’t wait to try the spinach, have yet to do that! Hmmm, I wonder if raspberry or cranberry would do the trick? I think your cake came out beautiful! I actually love the colors. Brilliant post! I have been wanting to try the exact same recipe you tried, so I’m so glad you did it first 😉 I wonder if cherries might work for the red? I LOVE this!! We did naturally dyed Easter eggs this year, and while it was time consuming, there was great satisfaction knowing that we wouldn’t be putting any artificial dyes into our bodies. This looks even tastier than eggs 🙂 I will have to pin this and give it a shot for the next party we throw! I’d go for chocolate too 🙂 🙂 Thanks for sharing this on The Creative HomeAcre Hop! I just wanted to let you know I featured this post on today’s Tuesday Baby link up. Swing by and check it out! I found that same recipe and got super excited! And alas, I had the beet issue as well. I tried making a single serving cupcake to get the pink to come out, and it’s still not quite there. I used 4 tablespoons and while the outside was the perfect pink color, the inside was light pinkish-brownish. I am really curious to know how she got it so red because I used way more beet juice than her recipe called for! I made this as well and got the same results. My cousin told me the colors changed due to oxidation. Two things he said I could have to done to try to fix it, 1. add some acid, like lemon to the batter. 2. Put it in a cooler of dry ice, because that would have sucked up the oxygen. I wondering if pomegranate would have made a nice red and since it’s an anti-oxident, it might not react as much. I searched long and hard for a naturally coloured pink cake recipe, with many failures. I finally discovered that the key is to use a cake recipe that uses only baking powder, no baking soda. The lovely pink beet colour will be retained only if it is in an acidic medium. Baking powder has an acidic ingredient in it, while baking soda is basic/alkaline. The recipe I used was this one, except I subbed strawberries for the raspberries (I don’t believe the berries impart much colour in the baked product, just the grated beets): http://www.brooklynsupper.net/2013/07/pink-raspberry-cake-with-buttercream-frosting-a-birthday-party-for-two/ The result with this recipe was a nice baby pink colour on the inside, with a deeper pink on the outside. I imagine you could substitute more beet for some of the berries to get a deeper pink hue, and less berry flavour (which was fairly mild with the original amount of berries). This recipe was easy in that no juicing or boiling of the beets was required – you just need to grate 1/4 cup of raw beet. However, to keep beet juice on hand just save the water from your beets the next time you boil them up to eat, and store it in 1/4-1/2 cup quantities in the freezer for later use. You can also concentrate it a great deal by simmering it in an open jar in a pot of water on the stove or in the slow cooker. I made some lovely deep red (slightly burgundy-red) coconut-shred sprinkles using concentrated beet juice. By the way, for a red velvet cake beets can work very well apparently, but only if regular cocoa (the lighter stuff) is used rather than the dutch processed cocoa (the darker stuff). Regular cocoa is acidic while dutch processed is alkalized. I am currently experimenting with concentrated red cabbage juice as a food colouring – it is pink/red in acid, purple on its own, blue/teal with a little baking soda, and green with more baking soda. I think the same pattern might hold for blueberry juice – that is next on my natural food colouring experiment to-do list! Trisha! Thanks so much for this excellent information! I used beet juice from pickled beets and the cake is kind of red, but my layer that was supposed to be blue turned up purple and the purple was an ugly gray (I put it in the garbage because it didn’t look edible).